Designers employ a variety of tools and techniques for speculating about buildings before they are built. In their simplest form, these are personal thought experiments. However, embracing advanced computer simulations means engaging a network of specialized people and powerful machines. 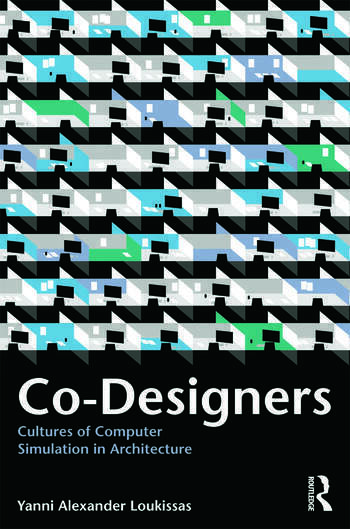 In this book, Yanni Alexander Loukissas demonstrates that new tools have profound implications for the social distribution of design work; computer simulations are technologies for collective imagination. Organized around the accounts of professional designers engaged in a high-stakes competition to redefine their work for the technological moment, this book explores the emerging cultures of computer simulation in architecture. Not only architects, but acousticians, fire safety engineers, and sustainability experts see themselves as co-designers in architecture, engaging new technologies for simulation in an evolving search for the roles and relationships that can bring them both professional acceptance and greater control over design. By illustrating how practices of simulation inform the social relationships and professional distinctions that define contemporary architecture, the book examines the cultural transformations taking place in design practice today. Yanni Alexander Loukissas is a Postdoctoral Associate in the Program in Science, Technology, and Society (STS) at MIT. He has also been a Visiting Lecturer in the Department of Architecture at Cornell University. He holds an SM and a PhD in Design and Computation from the Massachusetts Institute of Technology (MIT), as well as a BArch from Cornell University.